Don't be fooled by the unusual name, "Red Grout" is the signature dessert from the US Virgin Islands. This decadent tapioca and guava concoction is representative of the blend of cultures and influences throughout the history of the islands. This treat is traditionally served on March 31st, a holiday known as Transfer Day. This is a commemoration of the transfer of the islands from Denmark to the United States. On this date in 1917 the United States officially purchased the Virgin Islands from Denmark. Each year on this anniversary, the territory symbolically lowers the Danish flag and raises the stars and stripes. The holiday also features ceremonies and other opportunities to learn about and appreciate the Danish history of the islands. Serving Red Grout is one of the highlights of the Transfer Day celebration, because this tapioca dessert was first introduced by the Danish. Traditionally this dish is prepared with the seeds and skins of guava fruit. I simplified this version by using guava nectar. This way, the dish can be enjoyed year-round in all parts of the country, even if you don't have access to the gorgeous produce available in the Virgin Islands. Red Grout is typically served with a bit of vanilla cream. 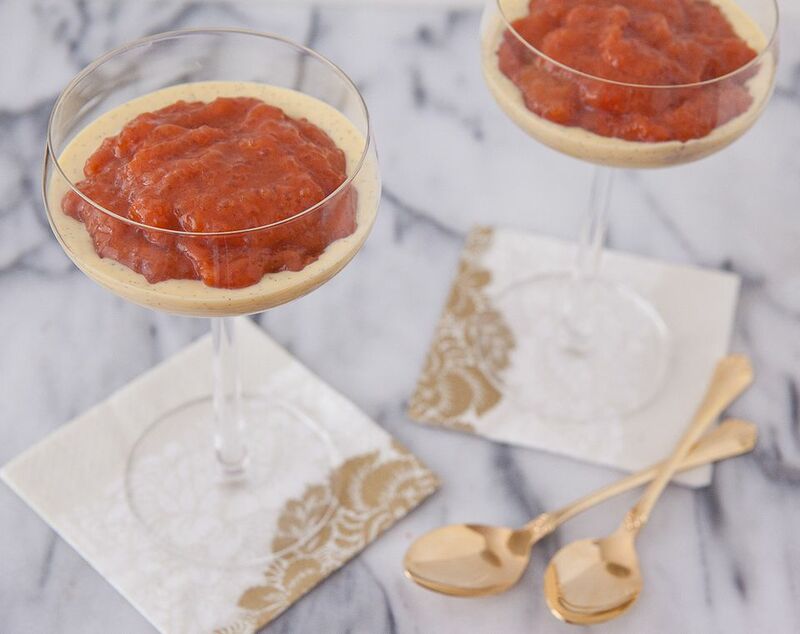 Spoon the guava-flavored tapioca into your serving dish and top with the vanilla cream for an authentic St. Croix dessert experience. In a medium sauce pan, bring guava nectar and sugar to a boil. Stir in salt, cinnamon and nutmeg. In a small container, combine the quick cooking tapioca with the water. Slowly add the tapioca mixture into the sauce pan and stir to combine. Bring to a boil once more, stirring constantly. Remove from the heat when the tapioca grains are clear. This should take about 13 minutes. While the red grout is cooling, prepare the vanilla cream. In a medium saucepan, combine milk and cream. Split the vanilla bean and scrape out the seeds into the milk mixture. Toss the split vanilla bean into the milk as well. Bring the milk mixture to a simmer and then remove from the heat. In a medium bowl, whisk egg yolks and sugar to combine. Gradually whisk the hot milk mixture into the yolk mixture. Return the custard to the sauce pan and stir over low heat until the custard thickens. (Do not boil) This will take about 5 minutes. Strain the sauce into a container, cover, and chill until ready to use. Note: The vanilla cream can be prepared up to 1 day ahead of serving. Spoon red grout into serving dishes, top with vanilla cream. Serve chilled.